Let me begin by saying that I’m really not a morning person, so when I say ‘easy breakfast ideas’ I really do mean ‘easy’. When you have kids, mornings are hectic enough so I’m not about to make life more complicated. Sometimes a bowl of cereal is fine, and sometimes it just isn’t enough to fill up their little tummies (and it can get boring), so all of these kid-friendly breakfast ideas are minus the cereal. These are breakfasts that are easy to make or prep the night before, leaving you with a less stressful morning and happy kids. All of these recipes have been featured on Mini Yummers before, so just click on the appropriate links to be taken to the full recipe–step-by-step pictures and all. I’ve tried to guide you through the best way to approach each recipe (below), depending on how much time you usually have in the mornings: I HAVE NO TIME, I HAVE SOME TIME, I HAVE SOME TIME TO SPARE. I HAVE NO TIME: I suggest you make these the night before and keep them stored in an airtight container until breakfast. If you want them warmed through, then pop them in the microwave for 10 seconds at a time, until you’re happy they’re at the right temperature. I HAVE SOME TIME: If you make a batch of these and have more than you need for one breakfast, then you can always freeze them–they’ll last a couple of months. Take them out the night before, and then reheat them in the oven for breakfast to revive them–around 10 minutes at 180c/350f/gas 4. I HAVE SOME TIME TO SPARE: There are two options here: Make the muffins from scratch in the morning; Or have your bowl of dry ingredients and your bowl of wet ingredients all ready and weighed out (and stored in the fridge). Then all you need to do is grate your apples and mix the contents of both bowls together. I HAVE NO TIME: Get up 15 minutes earlier tomorrow or leave it for a weekend :-). These really don’t take too long, but longer than the time you have today. I HAVE SOME TIME: Great! Get your ingredients together and prepped while the oven is heating up. Now put your eggs and ham breakfast cups together and bake them for 12-15 minutes. I HAVE SOME TIME TO SPARE: Get the kids to put their own breakfast cups together. I HAVE NO TIME: Make these the night before, cover them over and put in the fridge. In the morning reheat them in the microwave–20 seconds usually does it, but it depends on your microwave’s capacity. I HAVE SOME TIME: Make these according to the recipe and you can’t go wrong. I HAVE SOME TIME TO SPARE: Prep some fruit to add to the mix or to scatter on top of the cooked pancakes. Tastes great with yogurt too. I HAVE NO TIME: Bake the bread the night before. Then you can have it ready to slice up in the morning and either toast or warm through in the microwave. Tastes great with just butter spread on it (it already has beans and tomatoes inside it) or with an egg on top. I HAVE SOME TIME: Mix up and knead the bread dough the night before. Cover it over and leave to prove in the fridge overnight. In the morning, shape into a loaf while your oven heats up. Pop it into a loaf tin and bake. I HAVE SOME TIME TO SPARE: Well, it takes an hour to prove and 30 minutes to bake, and this isn’t counting the time taken to measure, mix, and knead. So unless you have a lot of time to spare, I’d go for the above option of making the dough the night before, and leaving in the fridge to prove. I HAVE NO TIME: Then meet your perfect easy breakfast idea! Kids love this one. Just mix together a handful of ingredients. Soak the bread in the mix and get it into the pan. Takes 2 minutes each side to cook. I HAVE SOME TIME: Cut up some strawberries, or whatever fruit you have to hand, while the toast is cooking, and pile them over the top of the toast. I HAVE SOME TIME TO SPARE: Make some for you too and put your feet up! 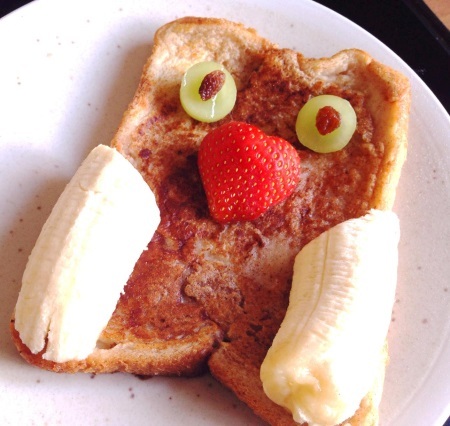 Or make the French toast into a funny fruity owl. 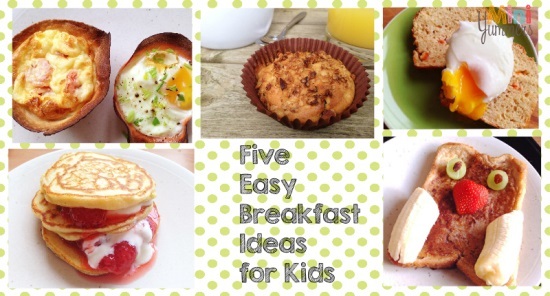 I hope you find these kid-friendly breakfast ideas useful–it’s nice to get away from cereal once in a while, but no one is expecting you to do this every day. You can keep up with more quick and easy ideas by subscribing to our newsletter–use the big green box at the top right of the page.